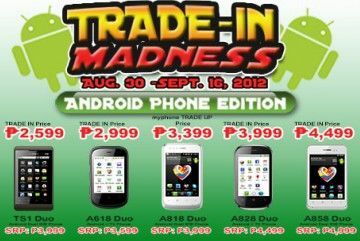 Myphone is offering an Android phone for any cellphone whether, working or broken and you will get a Myphone A818 Duo. A818 Duo is equipped with android 2.3 Gingerbread, 650MHz processor and the most famous features that myphone have a Dual Standby SIM Capability for Php 3,999.00. This Android phone offers a 3.5 capacitive touchscreen and has a WiFi capability.